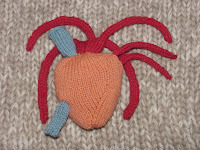 an anatomically correct knitted heart, complete with valves and chambers. Designed by Paul Magnusson of Whidbey Island. You can find the pattern for the heart here. Paul also designed a knitted hip replacement (scroll down for the hip) and some other neat stuff–a beautiful afghan, and even a camouflage suit! He is an interesting character and an amazing knitter. He and his wife have been knitting together for about 40 years.